this is a healthy smoothie recipe made with pomegranate (anar) and almond milk. add the pomegranate arils in the feeder tube of a juice extractor or electric juicer. extract the juice and then take the juice in a blender jar. add almond milk. you can use plain almond milk or cocoa flavored or vanilla. 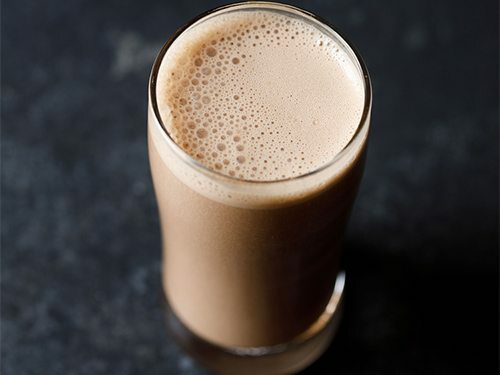 if using plain almond milk, then you can add 1 teaspoon of cocoa powder in the smoothie. even coconut milk can be used instead of almond milk. add 1 to 2 tablespoons unrefined cane sugar or maple syrup or honey or regular sugar. sweetener is optional. then blend pomegranate juice with almond milk. pour in a glass and serve pomegranate smoothie straightaway.